Explore the 29 mile (46.6km) Thames Estuary Path through the fascinating South Essex Marshes, from Tilbury Town all the way to Leigh-on-Sea. Passing through an industrial and settled beautiful landscape with a wealth of Green Heritage - history and biodiversity. The South Essex Marshes bordered to the north by settlement and the south by the shore of the Thames. It is a flat, low-lying landscape, dominated by creeks, marshes and mudflats. The path is easily accessible by train, linking 6 local train stations on one of the most attractive railway lines in the country (London Fenchurch to Shoeburyness line). The path is clearly signed and waymarked along the length with a new distinctive logo. 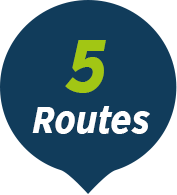 Download the TEP Mobile App and enjoy the path in 5 smaller tours starting and finishing at the local train stations. Delve into the history and biodiversity the marshlands have to offer and visit the many attractions along the way. You can download our individual maps, or the full overview map below. 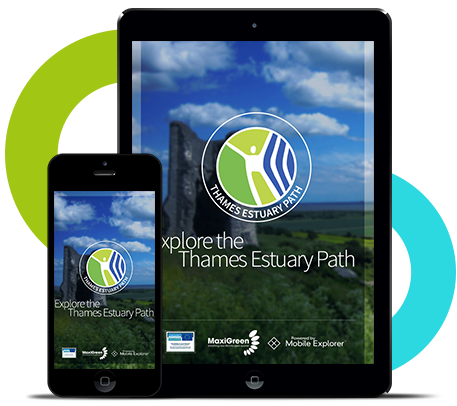 The Thames Estuary Path was funded by EU Interreg IVA 2 Seas Programme and forms an important strand of the MaxiGreen, supported by Essex County Council and Veolia North Thames Trust.